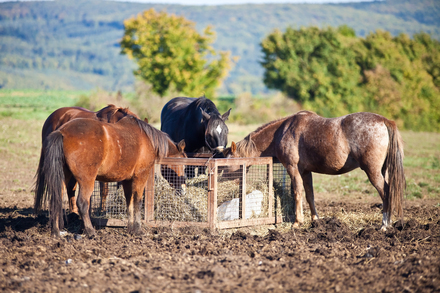 For most horse owners, feeding a horse is the major cost of ownership. The nutrition the horse needs, the cost of the hay, and the availability of the feed needs to be carefully balanced to make owning a horse possible for many people. Traditional feeds for horses include grass or alfalfa hay, corn, oats, a sweet feed of some type or commercially developed feed. Some years, good quality forage may be too expensive or unavailable. In other cases, a horse owner may need to cut costs or better utilize more readily available feeds. This is usually when consideration of feeds such as grain hay come into play. The nutrition the horse needs, the cost of the hay, and the availability of the feed needs to be carefully balanced to make owning a horse possible for many people. Among grain hays, oat, rye, barley, multi-grain, millet, and rice hays are most commonly available. Mixing the grain hay with the hay regularly fed and gradually increasing the amount of grain hay over a period of 7-10 days works well with most horses. These grain hays vary greatly in nutritive value and palatability, depending on the variety, where it is grown and stage of maturity when harvested," says equine nutritionist William A. Schurg, Ph.D., professor and equine specialist at the University of Arizona in Tucson. According to horse nutritionist Dr. Juliet Getty, "Grain hays tend to be higher in nitrates. While horses can tolerate nitrate levels up to 2 percent, it is best to have the hay tested before being fed. If this is the main source of forage in the diet, the horse will consume too much starch, leading to such problems as obesity, metabolic syndrome, and even laminitis." Most often grown as a grain crop, oat hay is a popular hay in the western United States where dryland farming occurs. The choice between alfalfa and oat hay depends on price per unit of energy or protein and the type of horse being fed. According to Dr. Getty, "Oat hay is an excellent feed for horses. The choice between alfalfa and oat hay depends on price per unit of energy or protein and the type of horse being fed. Depending on the area of the country in which it is grown, oat hay can be low in protein and contain only marginal calcium, phosphorus and carotene." "Oat hay is best cut when the oat seed is out of the milk stage and into the dough. This ensures a high quality product still showing some color with good carbohydrate content and sweetness in the stem. Cutting at the proper time means animals will eat the entire hay stem with little waste. Oat hay, like all grass hays, meets the nutritional needs of herbivores that need high fiber and low protein." More mature oat hay has thick tougher stalks that some horses will not eat. Since oat hay tends to be higher in nitrates and also high in sugar, this hay is not an option for insulin resistant horses. 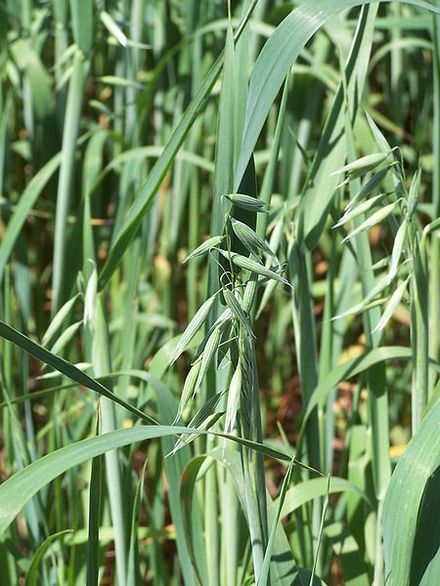 For best nutrition and palatability, oat hay needs to be cut at the right time when the oat seed is out of the milk stage and into the dough. This ensures a high quality product still showing some color with good carbohydrate content and sweetness in the stem. Cutting at the proper time means animals will eat the entire hay stem with little waste. Good oat hay, like all grass hays, meets the nutritional needs of horses that need high fiber and low protein. 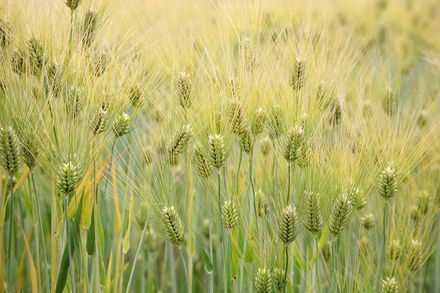 Barley hay is suitable as an alternative forage for horses. The average analysis of barley hay shows a relatively low level of energy and protein, with similar calcium and phosphorus values as oaten hay. Selecting barley hay that has been cut at the milky dough stage, so the grain and the barley awns are not fully developed is important when using it as feed for horses. Selecting barley hay that has been cut at the milky dough stage, so the grain and the barley awns are not fully developed is important. When feeding barley hay, be aware that awns from the heads may catch in a horse's teeth or cause ulcers in the horse's mouth. This means that you should only feed green, immature barley hay as the awns haven't had the chance to dry and become hardened. Barley hay should be green. Oat hay is considered to be more palatable than barley hay and is probably the first choice for this reason, but barley hay can be a useful hay when a horse doesn't need the extra energy and protein in alfalfa and a grass hay is needed. Forage hay is a multi-grain hay that consists of oats, wheat and barley. 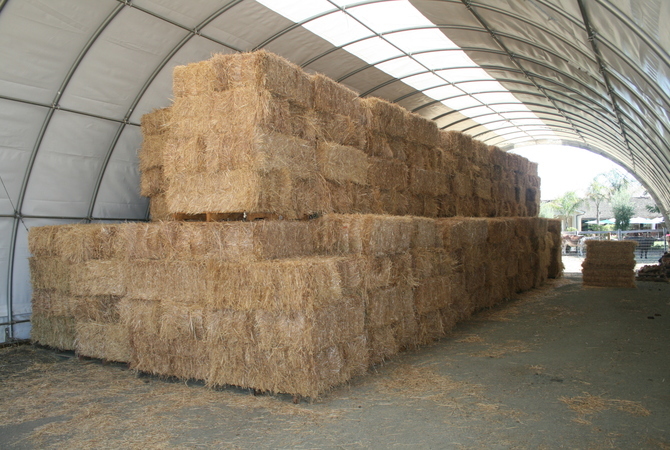 This hay is relatively new to the hay world, but has become popular and is a good feed source. Like oat hay, forage hay is cut at the optimal time to ensure a highly palatable feed for horses, cattle, goats and sheep. Usually the best forage hay is locally grown and is not overly irrigated so it does not develop large stems. This results in a desirable quality hay. Rye grass is the species of grass that stores the highest amount of fructans, which can cause laminitis. In the UK, it is fed to dairy cattle Since the higher fructans help produce higher milk yields, however, it is not suitable for all horses since they may not be able digest the fructans, which are converted to toxins in the hind gut resulting in laminitis. Although you know a thing or two about equine nutrition, the decision about what kind of hay to feed your horse is not an easy one. 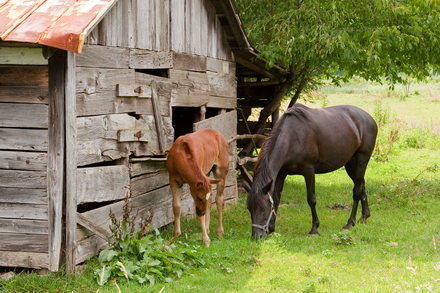 Spend time selecting the best forage you can afford to buy for your particular horse. Rye grass hay does work well for some horses. It is usually 8- 9% protein as fed and for horses that don't tend to put on weight and have moderate to heavy workloads, it may serve as a supplement to regular feed. Straw from more mature cereal grains can be fed to horses almost exclusively as a fiber source. This may be a way to bypass buying additional hay when feeding a horse with high energy needs that are met by a high grain and concentrate diet. Oat straw is generally considered best since it is softer and does not have the awns that are on barley and some wheat straw. Straws are very low in Vitamin A and about half of the phosphorus needed for a mature horse. In some areas, foxtail or German millet are used as horse forage. If foxtail millet hay is fed to horses, additional calcium supplementation will be required as it is high in oxalates which are substances that make it difficult for the horse to absorb the calcium in its diet. Some reports show that horses fed millet hay may show symptoms of lameness and joint swelling. Horses may also react to to alkaloids in millet hay because they are susceptible to alkaloid toxicity syndromes. All millets can accumulate nitrates, which can reach toxic proportions. In addition, German millet can cause lesions in the horse's mouth. Generally, it is recommended that cereal grain hays whether in bale, cube or pellet form including oat hay, barley hay, and forage hay should not exceed more than 50% of the total forage consumed per day by a horse. In addition the maturity of the cereal grain hay need to be considered because the seed heads of cereal grain hays provide an unknown, relative to nonstructural carbohydrate intake of a horse. In addition, most cereal grain hays are at a maturity that translates to fiber levels that are often less palatable. Subsequently, horses will select the grain-heads and consume less of the fiber portion of the forage. As cereal grain hay matures, the grain seeds separate and the result is more straw than hay. Grain hays are high in digestible fiber which are readily broken down by microbes in the cecum or hind gut of horses when harvested at a soft dough stage. Grain hays are high in digestible fiber which are readily broken down by microbes in the cecum or hind gut of horses when harvested at a soft dough stage although rice hays often fall in the poorly digested range. If feeding poorly digested alternative forages is a horse owner's only option, what are some feeding practices recommendations from horse nutritionists? If grain hay is overly mature, which is often the case, horses may act disinterested in the hay and might not voluntarily consume it as readily as other grass hays to which they are more accustomed. Also, the horse owner needs to be aware that low quality coarse hay may potentially contribute to impaction-type colic in horses. Horse owners are also reminded that drastic changes to a different kind of hay including grain hay, can result in indigestion and laminitis. Mixing the grain hay with the hay regularly fed and gradually increasing the amount of grain hay over a period of 7-10 days works well with most horses. Grain hays comprised of sorghum grass and Johnson grass hay should NOT be fed to horses because of toxicity levels of these plants. Sorghum grasses include sudangrass, johnsongrass, hybrid forage sorghums, and grain sorghums. 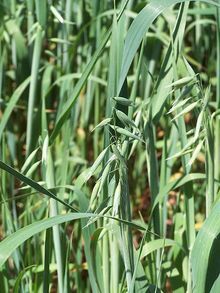 All classes of forage sudangrasses and associated hybrids have toxicity levels that make them unfit for horse feed. Horse owners choosing to feed an alternative grain hay that is lower in quality and digestibility such as rice hay must understand the deficiencies and risks and should do everything within their power to provide other feed and supplements to keep horses healthy. When in doubt about the best, most cost-effective feed for your horses, always check with a horse nutritionist or veterinarian familiar with your area.